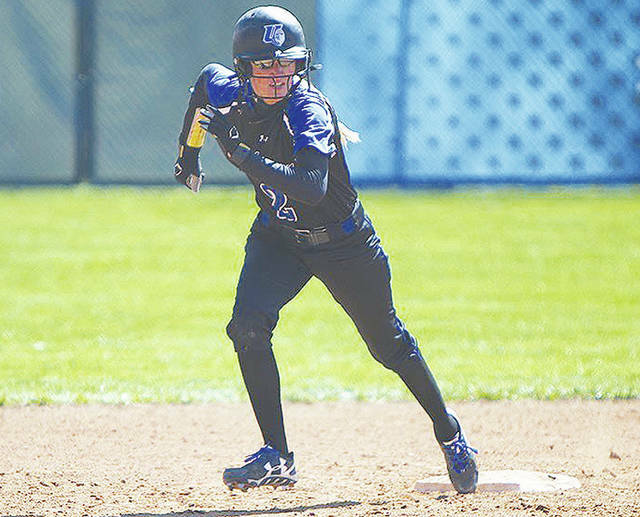 UU’s Jenna VanHoose (pictured) had a hit and scored a run in Sunday’s first game at Wheeling Jesuit. WHEELING, W. Va. – The Urbana University softball team suffered two losses at Wheeling Jesuit on Sunday by final scores of 12-4 and 8-6. Wheeling Jesuit (6-14, 3-1 MEC) scored six times, including a pair of home runs, in the first inning and five in the third to race past UU. The Blue Knights put up four runs in the top of the fifth, but it was too little, too late. Mikayla Kesel and Jenna VanHoose led off with singles, before Erin Gardner plated the first run with an RBI single. Britney Bonno, who led UU with four hits on her birthday, stepped in next and delivered a two-run triple to right field. After a Mia Smallwood RBI groundout, the Blue Knights trailed 11-4. WJU’s Ashley Ledbetter ended the game with a walk-off homer in the bottom of the fifth. The Cardinals totaled 15 hits while the Blue Knights produced eight. UU grabbed a 1-0 lead in the first at-bat after Mackenzie Frantz provided a two-out single. However, WJU jumped all over the Blue Knights again with five runs in the opening frame. This time, UU responded by scoring four runs on five hits in the next frame to knot the score at 5-5. Gardner, Smallwood and Kayleigh Pate, who extended her hitting streak to seven games, produced the run-scoring hits. However, the Cardinals added runs in the second, third and fifth innings to hold on to the lead. Frantz brought across Bonno in the fourth to make it a one-run game, 7-6, but that was as close as the Blue Knights could get. UU combined for 11 hits and stranded nine runners in the nightcap. Bonno, Pate and Mykee Holtz each had two hits to lead the way. The Blue Knights lost a pair of games at West Liberty on Saturday, 9-1 and 4-3. UU (1-17, 0-4 MEC) travels to Walsh on Wednesday for a non-conference doubleheader in North Canton, Ohio. The Blue Knights will host Shepherd and Fairmont State over the weekend.